For a course on the U.S.-Mexican War, professor Vialla Hartfield- Méndez had students read articles written in English and Spanish, then cut them apart to create a new narrative. Emory faculty and students can learn more about the teaching method at upcoming events. What: "The Work of Art in the World Creates Pre-Texts for Teaching and Learning"
When: Friday, April 1, 4-5:30 p.m.
Last spring, Vialla Hartfield-Méndez decided to try something different in the classroom. For a course focused on the U.S.-Mexican War, Hartfield-Méndez, a professor of pedagogy in the Department of Spanish and Portuguese, asked her students to read an article written in English about events leading up to the war and the resulting conflict. Then she asked the students to read another article written in Spanish by a Mexican historian. Next, she reached for scissors, glue and other basic art supplies. Providing photocopies of both articles, she divided her students into teams of two and asked them to use the text to create collages, selecting 10 sentences to cut out and arrange into a new narrative about the war, then decorate it any way they chose. The result? 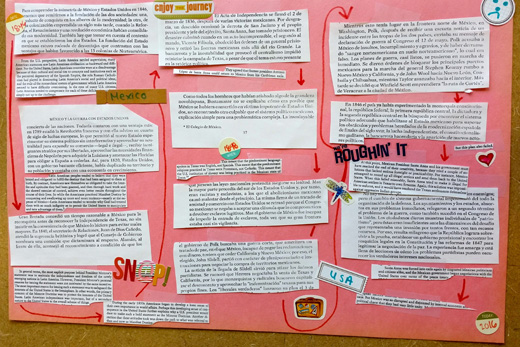 "Students had to really understand what was happening in both of those texts, then collaborate to decide what they would choose to reflect," she recalls. "In the process, they became very familiar with the facts being discussed," she says. "Then they shared what they had created." Later, when Hartfield-Méndez asked students what they had accomplished through the project, the classroom conversation hit upon "everything I had ever wished would come up in a senior seminar about those two articles," she says. "They said things like, 'In order to choose what to include, we had to choose what to omit,' which is actually what historians do," she explains. "The participants really focused on the text at hand and got to be creative with it. That's when they stopped being students and started being readers, interacting with what was going on." The classroom approach is called "Pre-Texts," a learning method that uses art to engage students with challenging textual materials. And Hartfield-Méndez is among a handful of Emory faculty members who've experimented broadly with it in classrooms and coursework over the past year. "It's applicable to learning at all levels," she says. Emory faculty and students interested in learning more about the Pre-Texts method and other ways in which the arts can be at the center of learning and civic engagement are invited to attend a lecture and participate in a weekend workshop. The program opens Friday, April 1, with a public talk by Doris Sommer, who directs the Cultural Agents Initiative at Harvard University, where she serves as Ira and Jewell Williams Professor of Romance Languages and Literatures and of African and African American studies. Sommer, the developer of the Pre-Texts workshops program and author of "The Work of Art in the World," will speak on "The Work of Art in the World Creates Pre-Texts for Teaching and Learning" from 4 to 5:30 p.m. in the Jones Room of the Woodruff Library. The event is free and open to the public. Her talk is presented by the Center for Faculty Development and Excellence and the Coalition for the Liberal Arts (CoLA), where Hartfield- Méndez serves as director of engaged learning. It is co-sponsored by the Department of Spanish and Portuguese; the Hightower Fund; the Emory Center for Ethics; the Latin American and Caribbean Studies Program; the American Studies Program; the IDEAS Fellows Program; the Emory College Language Center; and the Office of Residence Life. Sommer's presentation will be immediately followed by a storytelling event, featuring a dialogue about how an experience with art can impact your perspective and subsequent storytelling circles with select guests. The closed event is presented in collaboration with the Media, Literature and Arts Outreach residence house and the IDEAS Fellows in the Institute for the Liberal Arts and continues a practice launched by CoLA. On Saturday, April 2, participants are invited to attend a Pre-Texts workshop at the Emory Center for Ethics. Emory faculty who have already received training and have experience employing Pre-Texts learning in the classroom will serve as facilitators, says Hartfield-Méndez. Following a breakfast meeting with Sommer, three simultaneous Pre-Texts workshops will be led by facilitators from 10 a.m. to 2 p.m. "Basically, it's a wonderful opportunity to have a taste of the Pre-Texts experience," Hartfield-Méndez says. Space is limited to 60 participants, and pre-registration is required. Those interested in more information about the workshop or registering for it should contact Hartfield-Méndez' graduate assistant, Johannes Kleiner, at jkleine@emory.edu.